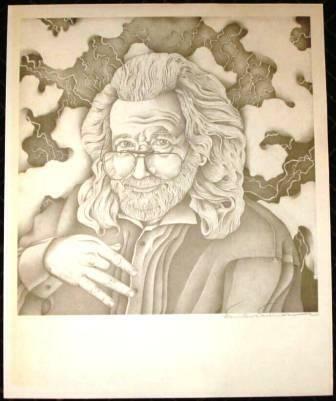 This Jerry Garcia poster print was designed by David Drennon in 1994. The poster is printed on parchment type paper and measures approximately 17" x 23". It is hand signed by David This print would look great framed on the wall. David is a pen and ink artist that does intricate and detailed drawings of his subjects. He prints on high quality paper such as Bristol Paper and Krome Kote Paper. He hand-signs all his artwork.